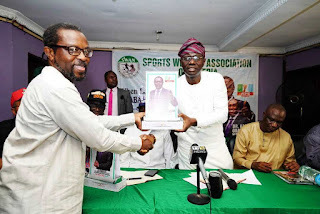 The All Progressives Congress (APC) governorship candidate in Lagos State, Mr Babajide Sanwo-Olu, has reiterated his commitment to revive sporting activities in the state if elected, reports ITREALMS. He made the commitment while he was speaking with members of Sports Writers Association of Nigeria (SWAN) at its secretariat in National Stadium, Surulere. "Lagos has always been a centre of excellence in sports development and production of talents in various sports in Nigeria. Some of our footballers and athletes who later became national and international icons were discovered in Lagos, Sports are very important to national development and promoting the right image for a country and state. Lagos should commit and invest in grassroots sports development so we can have new Okocha, Kanu Nwankwo, Mary Onyali, Segun Odegbami among others.